Pozole is one of Mexico's oldest soups, supposedly dating back to Aztec times. Though nowadays there are a million different versions, this old-school recipe has a smoky red stock spiced with pureed chiles. 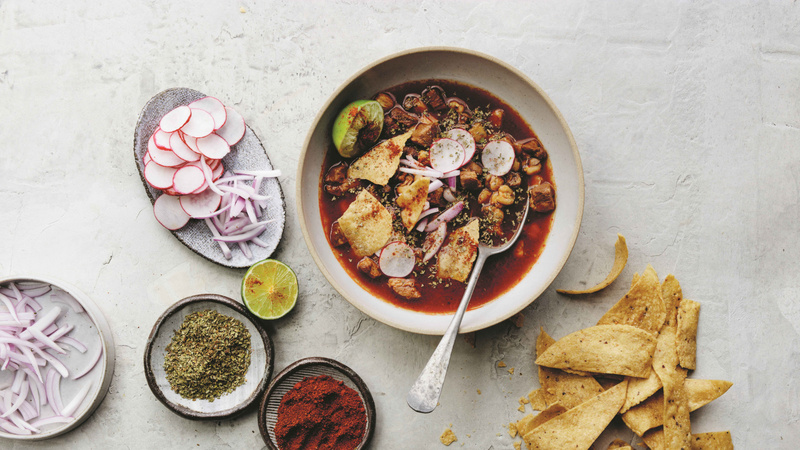 You wouldn't call it pozole without the addition of hominy—whole white corn kernels that have been acidified to soften their casings and render their kernels plump and chewy. Pozole is all about the garnishes, from corn chips to radishes, limes, cabbage, and fresh oregano. Feel free to pile them high in your bowl. And because every Mexican has to have something spicy on the table, we finish ours with a mix of ground chilli powders (or you can substitute hot sauce). You need a large stockpot to make this dish, or you can divide it among two large cast iron casserole dishes. Place the chiles in a heatproof bowl and add boiling water to cover; let sit until the chiles are softened, about 20 minutes. Transfer the chiles to a blender (reserve the soaking water). Add the garlic, onion, oregano, cumin, and a generous pinch of salt to the blender and puree, adding just enough of the soaking water to form a thick, smooth paste. In a piece of cheesecloth, wrap the onion, garlic, coriander stems, and bay leaves; secure with twine to form a bundle, then set aside. Season the pork on all sides generously with salt. Place the pork, adobo, and the cheesecloth sachet in a large stockpot; add 5½ litres of water to cover, and stir or whisk to incorporate the adobo. Season generously with salt, then bring to a boil. Reduce to a simmer and let it cook until the pork is tender, about 1 hour. Bring the stew back to a simmer. Taste and adjust the seasoning as needed. Ladle into 8 serving bowls and serve with the cabbage, radishes, red onion, limes, chilli powder, oregano, coriander, and tortilla chips. From Nopalito: A Mexican Kitchen by Gonzalo Guzmán; photography by Eva Kolenko. Published by Ten Speed Press (an imprint of Penguin Random House).